There are teenagers and then there is Declan Rice. The 19-year-old appreciates that he's part of a select group playing Premier League football at this stage of his life. But a brief period of time in his company makes it clear he doesn't fit the stereotype for his age. He doesn't speak or carry himself like an ordinary 19-year-old. This week in Antalya will represent the formal start of what promises to be a long international career, and the good news is that he intends to spend the entirety of it wearing green. Martin O'Neill said earlier this month that he would not be placing any pressure on the shoulders of the West Ham player. 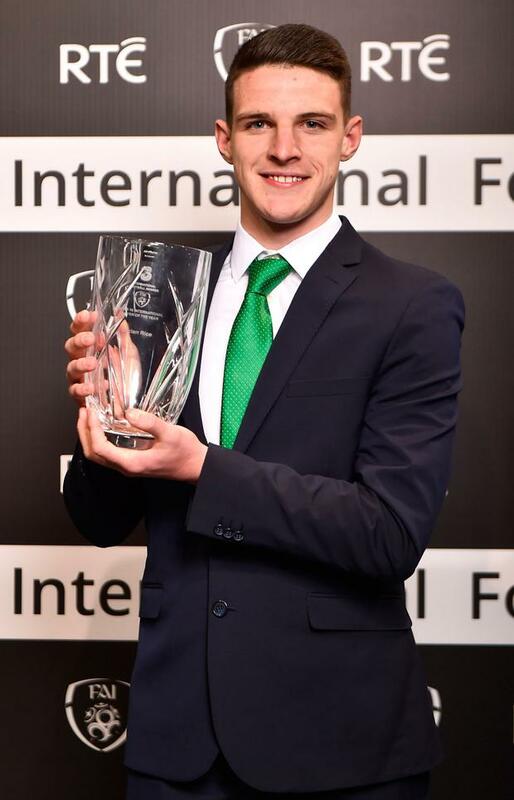 And attending the FAI awards to collect a trophy cannot be interpreted as a permanent commitment; Jack Grealish proved that point. Rice is a different type of character, however, and he was entirely comfortable when presented with a gathering of journalists and a predictable line of questioning. He dealt with them all comfortably, engaged with every query and finished up by shaking every hand and bidding farewell to his inquisitors. It's no surprise that he has captained teams on his journey up the ranks, because it seems that responsibility sits well with him. "To be honest, we're professional footballers," he shrugged when asked if the fuss over reported interest from England had affected him in any way. "There's always going to be speculation, whether it's good stuff or bad stuff. It's about how you take it on." 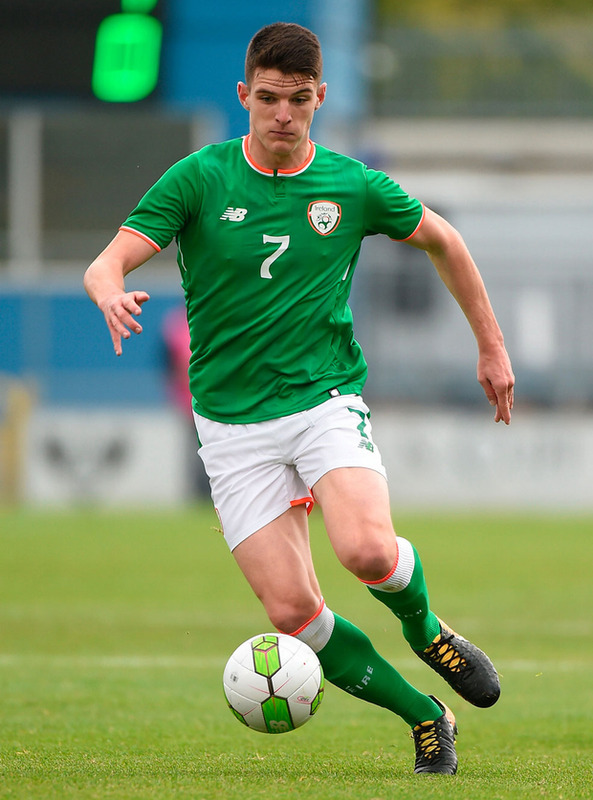 Rice has affirmed his commitment and says he wouldn't have flown to Dublin to pick up the U-19 award on Sunday or to Turkey for Friday's friendly if he had any plans to change course. This is his future. "I'm fully focused on playing for Ireland," he asserted. "There's no decision to be made. If I didn't want to be playing for Ireland, I wouldn't be here." That is the news that Ireland supporters wanted to hear and they can thank talent scout Mark O'Toole for his work in spotting Rice and ascertaining the family connections on his father Sean's side. His grandparents Jack and Margaret hailed from Douglas in Cork before moving to England. They were overjoyed to watch their grandson play for Ireland at U-16 level, but they both passed away two years ago within a fortnight of each other. Rice is doing this for them, insisting: "They'll be looking down on me very proud. My dad is really, really proud. He wants me to play for Ireland. "Mark O'Toole has been excellent for me, he's been like a father figure to be honest. He'd been watching me for a while and called my dad. He said, 'There's a training camp coming up, you're eligible. Would you like to come along?' I was only 15 years old and straight away I said, 'Of course'." That actually came during a difficult period for Rice at West Ham, where growing pains had raised concerns about his development. He wasn't sure if he was going to be taken on as a scholar, fears that were unfounded. Already, he had suffered the pain of being released by Chelsea, the club he had supported as a boy growing up in Kingston-upon-Thames. He still did enough while he was there to inherit a famous friend, and a major influence on his development. "Me and John Terry are really good friends," he said. "When I got released from Chelsea, he gave me a call and we spoke for about 45 minutes. I told him I was going to West Ham. "He was my idol growing up and to ask him a load of questions and for him to answer them back, I'll always remember that call. "We live locally to each other and now and then we meet up. We met the other day and we had a catch-up, and he's always going to help me and pass on his experiences." They had a fair bit to talk about, seeing that Rice has grown into a first team player - he's aware of his own stats and recites his tally of 25 appearances - and is now immersed in a relegation battle in a rancorous environment. Disturbances at the London Stadium have highlighted deep-seated supporter discontent. He diplomatically deals with that too. "The fans pay their money and they've got every right to not be happy," said the West Ham youngster. "We haven't been performing in recent weeks. "For me, as a 19-year-old, I've had a lot of experiences this season both good and bad and this will only make me mentally stronger as well seeing what's going on. I think we're going to have a strong end to the season. Our squad is too good to be relegated." West Ham management had no issue with Rice coming away for this break, and it's an extended international gathering as he will finish up in Turkey and join Noel King's U-21 team for their qualifier with Azerbaijan in Tallaght next Tuesday. "You've the manager (David Moyes) who is Scottish, you have people like Stuart Pearce there who is English. "They're very happy, they were delighted for me to come and play for Ireland. They've been very supportive. The manager is delighted for me to be here with Ireland and so am I." Evidently, they trust the player to keep his feet on the ground. That confidence is understandable. For all that, he's an early developer in senior terms, his experience with rejection and the realisation he had more work to do has positively affected his mentality. A year ago, Rice expected that he would be spending this campaign out on loan. Instead, he's gained a top-flight reputation from rubbing shoulders with the best and attributes that to perseverance. "I think it can be done by anyone," he said. "If you have the right mindset and the ability. Hard work always beats talent. "I wasn't the best when I was younger. I worked hard, and the talent came through. There are a lot of boys out there that can definitely break into the first team. It's just about getting the chance." Positionally, he is flexible. He was a midfielder all the way up the ranks until a one-game experiment with a central defensive berth led to West Ham re-evaluating his brief. He will be content with any sort of role on Friday. What's certain is that he will be belting out the anthem beforehand, a consequence of the FAI bringing in a woman to teach the underage squads 'Amhrán na bhFiann'. Rice has enjoyed singing it before matches. "I've probably played over 40 games in all for Ireland since I was a kid," he continued. "It's such a good national anthem, it's so catchy. You know the words straight away." Does he know what the lyrics mean in English? "No I don't," he replied, smiling. "I just know how to sing it. I think it's good that you sing it before the games. It means something to you, it's passionate." His actions are easy to interpret, and they speak louder than any words. Ireland have a player on their hands and he's not going anywhere.